Pitch In For Baseball is delighted to have been selected to participate in State Farm’s ‘Go To Bat’ campaign. Now we need your help! 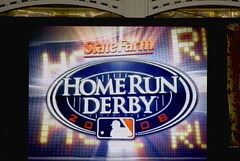 ‘Go To Bat’ was launched nationally during the State Farm Home Run Derby. ‘Go To Bat’ gives entrants a chance to win tickets to the upcoming World Series and selected charity partners the chance to receive significant financial support. Go to www.statefarm.com/gotobat to register for your chance to win World Series tickets. As you register, you will get a chance to designate a charity that could win up to $25,000/week. To designate Pitch In For Baseball as your charity, select PUBLIC GOOD as the charity category and then choose Pitch In For Baseball from the drop down list.